This Hand Soap is a luxurious blend of coconut-based soap, lemongrass essential oil and grapefruit seed extract. Its gentle formula will clean hands leave a pleasant lemongrass scent. The generous sized bottle looks stylish in the kitchen or the bathroom. Vegan, cruelty free and carbon neutral. Aqua, Cocoamidopropyl Betaine, Sodium Coco-Sulfate, Cocamidpropylamine Oxide, Citrus Grandis (Grapefruit) Seed Extract, Phenoxyethanol (Preservative), Glycerin (plant-based skin softener), Tocopherol (Natural vitamin E), (contains EU allergens: citral, benzyl benzoate). 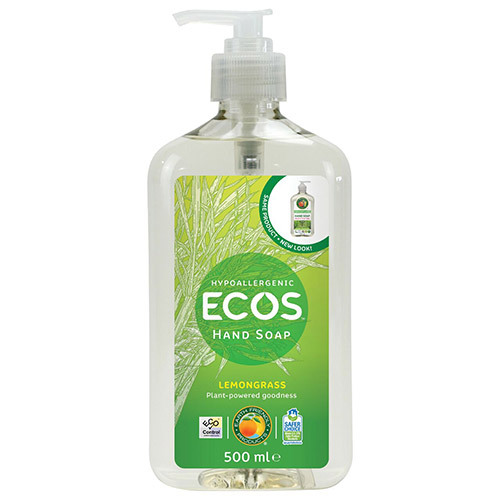 Below are reviews of ECOS Hand Soap - Lemongrass - 500ml by bodykind customers. If you have tried this product we'd love to hear what you think so please leave a review. Great handwash, with a nice smell and cleans your hands well. All natural materials, so kind to the skin. Cleans very well, and a lovely fragrance, would buy again.